The Training Fan has 96 pages of concise, easy to use instruction. It includes guidelines for cardiovascular, strength and flexibility training, and over 70 strength exercises, 20 stretches, and 3 complete workouts. It is tough and durable — printed on water-resistant and tear proof synthetic paper, pages 'fan' out around a bolt binding. Workout anywhere, anytime, regardless of the equipment you have on hand with this portable workout guide. It’s like having a personal trainer in your pocket. Weight training, cardio exercises and flexibility training in an easy-to-use, handy format. Over 70 exercises, 20 stretches, and 3 complete workout programs. Great for home workouts, at the gym or for workouts while you travel. Exercises are grouped in color-coded sections according to the muscle groups you’ll work, and then sub-divided according to the exercise equipment you’ll use (exercises that use no equipment, exercises that use minimal equipment such as dumbbells, resistance bands and other portable fitness equipment, or weight machines). Printed on a luxurious and indestructible water-resistant, tear-resistant paper. Includes full color anatomical illustrations and training logs to write goals and track progress. 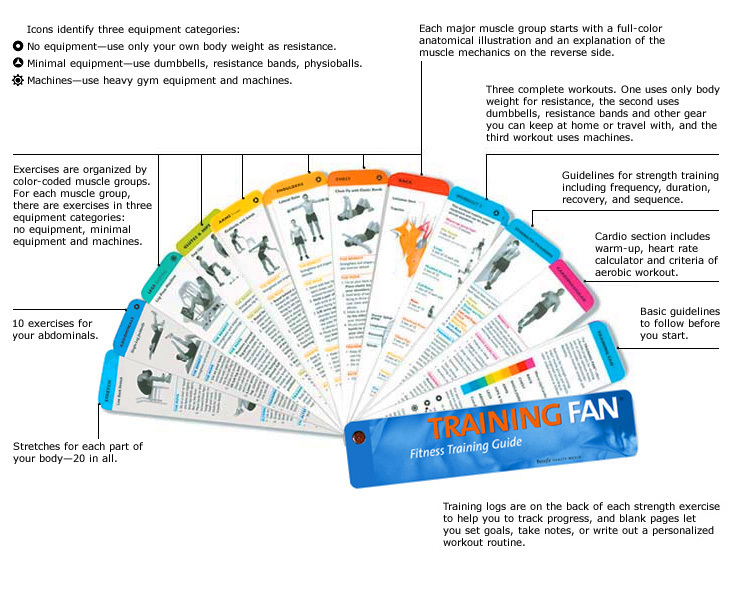 High quality, beautiful design and comprehensive content makes the Training Fan the perfect inexpensive fitness gift.